Leah ReminiRelease Date: December 21st, 2018Second Act is a comedy in the vein of Working Girl and Maid In Manhattan. 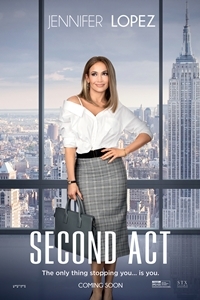 Jennifer Lopez stars as Maya, a 40-year-old woman struggling with frustrations from unfulfilled dreams. Until, that is, she gets the chance to prove to Madison Avenue that street smarts are as valuable as book smarts, and that it is never too late for a Second Act.